Emory psychologist Nadine Kaslow earns Emory's 2013 Thomas Jefferson Award for significant service through personal activities, influence and leadership. Emory Photo/Video. Emory psychologist Nadine Kaslow often fields calls from the media to comment on mental health topics, such as coping in times of tragedy. On the day of her interview with Emory Report, she had just spoken to ABC News about the Boston Marathon tragedy that had rocked the nation the day before. "What I try to do in these horrible situations is provide an empathetic psychologically minded view that's helpful to the public, to calm and educate people about the psychological impacts of tragedies," she says. In the case of Boston, "I try to juxtapose the tragedy with the symbolism of the marathon: courage and strength, endurance, commitment and dedication." These characteristics could also be used to describe Kaslow, who earned Emory's 2013 Thomas Jefferson Award for significant service through personal activities, influence and leadership. How does she balance multiple roles as professor and vice chair in the Department of Psychiatry and Behavioral Science; director of the Postdoctoral Fellowship Program in Professional Psychology for Emory School of Medicine; chief psychologist at Grady Memorial Hospital; and joint appointments in the departments of psychology, pediatrics and emergency medicine? Not to mention national leadership roles as president-elect of the American Psychological Association; editor of the Journal of Family Psychology; and resident psychologist with the Atlanta Ballet? "I get involved in activities that genuinely matter to me," she explains. "I care about children and families, about reducing violence, whether it be gun violence or suicide prevention efforts on campus ­— I am passionate about making the world a safer place. I am dedicated to quality and culturally relevant patient care for underserved people, and also about innovative and interdisciplinary education and training." A firm believer that exercise is key to physical and emotional well-being, Kaslow practices ballet almost every day. "It's part of my self-care," she explains. "It's away time in which I have the opportunity to combine athleticism with artistry. I really love that." As resident psychologist for the Atlanta Ballet, Kaslow leads wellness programs and therapy sessions. Her outreach includes helping ballerinas deal with body image issues and drive for perfection — concerns often shared by college students. At Emory, Kaslow has counseled students on similar issues. 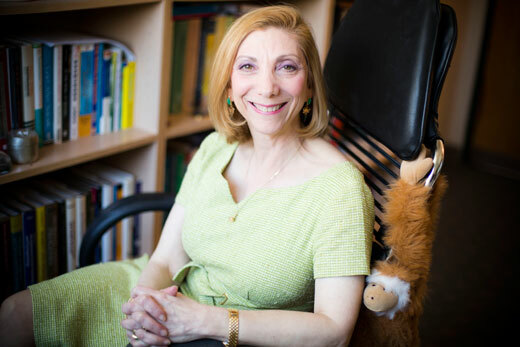 A nationally recognized expert in suicide, she helped secure a three-year federal grant to launch a university-wide suicide prevention program, Emory Cares 4 U. Kaslow said she's proud that suicide prevention has been institutionalized — it's now part of the Student Counseling Center — and that the program has trained more faculty, staff and students as "gatekeepers" to recognize and respond to those in need. She hopes it has helped reduce stigma. A past-president of the University Senate and Faculty Council among other roles, Kaslow is a committed university citizen. Most recently she co-chaired the Committee on Class and Labor, a multi-year campus-wide examination of various aspects of class and status at Emory. Kaslow's research focuses on culturally competent assessment and treatment of suicidal behavior and intimate partner violence in African American women, and the impact of intimate partner violence on children. She's also adapting a compassion meditation program for low-income African American men and women. "I cherish being involved in the community, whether it's Emory, Atlanta, Grady or the psychology world," Kaslow says. "I'm invested in tackling challenging issues in our community and finding ways to bring people together and come up with a strategic and visionary plan for moving forward." Kaslow, who recently won the Inspiring Mentor Award from the Grady Health Foundation, says she is thrilled to be presented with the Jefferson Award at Emory's 168th Commencement ceremony. "I think there's something very special in being honored at home. It means the most," she says. "The reality is, when you do community service you don't do it to for public recognition. You do it because it matters. Receiving this award is just an extra special gift." Kaslow, who last year gave commencement addresses at Wright State University and Pepperdine University, where she also received an honorary degree, offers this advice for Emory's Class of 2013: "Ask not what others can do for you, but what you can do for others. The people's lives you touch will be enriched and empowered. In turn, you will experience many riches and gifts, and find your life more meaningful, satisfying and fun."